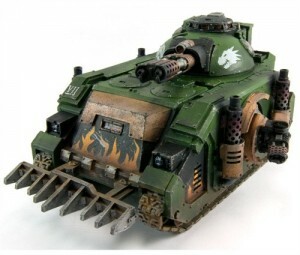 Forge World has started taking pre-orders for their Deimos pattern Predator Infernus. The answer to the question, "who's got two thumbs a light?" is, "this guy!" The Deimos Pattern Predator Infernus, designed by Will Hayes, is a detailed resin and plastic complete kit that contains two different turret weapon options, a Magna-Melta and a Flamestorm Cannon, and two different sets of sponson weapons, Heavy Flamers or Heavy Bolters. Experimental rules for this powerful vehicle can be downloaded here, and it is available to pre-order now for despatch from Friday 31st August.